I hope everyone had a Happy Easter with their friends, families, and baseball card collections! Today, I begin the look at Indians Uniform Number 8. We have some big guns and some big mouths in the "Number Eights," and this is just Part 1! Hang on for the ride, and thanks for stopping by!! Alan Ashby - 4 seasons (1973-1976) - His first two years in the majors provided two of the worst seasonal averages of his career (.172 and .143 respectively). The next two years fared better for him, but his best years came with the Blue Jays and the Astros. Ashby wore #8 for his entire Tribe career. He played 200 games with the Indians. In his 537 at-bats, he got 122 hits for 63 runs, 16 doubles, 2 triples, and 10 home runs for 67 RBIs. Unfortunately, he left the Indians with an overall .194 average. The Indians traded him to the Toronto Blue Jays in '76, thus making him the first player ever traded to the Blue Jays. Albert Belle - 8 seasons (1989-1996) - In 1989, Belle wore number 36, then switched to jersey #8 for the rest of his Indians career. Belle introduced himself to the MLB as "Joey," but soon opted to use his real first name. For whatever reason, I had not really paid much attention to Belle's antics until after he was long gone from the Tribe. In fact, I had always thought of him as one of the Indians best players. And, statistically, he was up there. He had five 100+ RBI seasons, five 30+ home run seasons, five 80+ run seasons, and six .250+ average seasons (with five of those being .290 or better). Overall, he score 592 runs on 1014 hits garnering 751 RBIs. I mean, shoot, we're talking roughly 75% of hits were RBIs for Pete's sake! He made four consecutive AL all-star teams (1993-1996), two division series (1995-1996), an ALCS (1995), and a World Series appearance (1995). Unfortunately, his list of crazy antics is longer than his list of on-field achievements. Things were so bad, that Wikipedia has an entire section devoted to the controversy that was Albert Belle (read it all here folks). I will state here and now, that regardless of the stats, I cannot in good faith put him the running for All-Time Triber #8. If the need arises, I may him an asterisk... LOL, yeah, right. Alfredo Griffin - 3 seasons (1976-1978) - Griffin played in the Number 16 for his rookie season, then switched to #8 for the last two years of his Indians days. He did not play any full seasons with Tribe, but managed to pull his career high and career low averages during his tenure. In '77, he pulled a .146 in 14 games and the next year he batted .500. Sorry to burst any bubbles, but he only had 4 at-bats that year, so one would HOPE for at least a .500 average. In 49 appearances at the plate with the Tribe, he had zero triples and zero home runs, with 3 RBIs. Only because of his .500 "season," he was able to pull a .299 overall average. Bill Brenzel - 2 seasons (1934-35) - Brenzel came to the Indians by way of the Pirates through the Pacific Coast League. He played in 67 games for the Indians, scoring 16 runs (17 RBIs) on 42 hits with 8 doubles and a triple. He had a .216 average his first year with the Tribe and ended his major league career with a .218 the next year. Bob Hale - 2 seasons (1960-61) - Hale played part of the 1960 season wearing #8, but then switched to #9 for the rest of his playing days in Cleveland before being picked up by the Yankees. Because he spent only part of a season in #8, I am going to "save" his info for when we look at Uniform Number 9. Carmen Castillo - 7 seasons (1982-88) - Castillo played his first year at Number 52, but then switched to Number 8 for the remainder of his Cleveland career. Of his 7 seasons, five of them were .250 average or better and one was a .245. His worst as a Triber was his rookie year, when he batted .208 for the season. I don't know why, but this was one of my favorite Tribe cards in the 80's. To me, he looked like we was ready for some serious baseball action. It seems weird to look at his stats and then realize he was only a part-time player who never batted in more than 89 games per season. In seven seasons, he played in 464 games with 1152 at-bats, getting 295 hits (156 runs with 152 RBIs), 54 doubles, 4 triples, and 47 home runs. He left the Indians with a .256 overall average and went to Minnesota. It'll be interesting to see how he fares against some of the other "Number Eight-ers" in the list. Duke Sims - 7 seasons (1964-70) - Like Hale before him, Sims started out in Number 8 but switched to Number 9 after his rookie year. 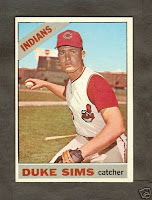 Because the name "Duke Sims" often evokes the glazed over look of waxing nostalgia, I find it sadistically wonderful that his rookie year netted him 6 at-bats (in only 2 games) with 2 strike outs, while garnering nothing else. His rookie year started him out at the bottom with a .000 average. As we will see in the Number 9's, he did not stay there. Ed Fitz Gerald - Part of 1 season (1959) - Fitz Gerald (yes, that is two names) ended his major league career in a Tribe uniform. He made 129 showings at the plate, getting 35 hits with 12 runs (4 RBIs). He hit 6 doubles and a single triple and a single home run. He ended his career with a .271 season, .343 on-base percentage and a "magnum" slugging percentage (.357). Frankie Pytlak - 9 seasons (1932-1940) - Pytlak spent the first five seasons of his career wearing Number 11, then switched to Number 8 for the last four years of his Tribe days. While wearing Number 8, he had 307 hits on 1,093 at-bats while getting 33 doubles, 19 triples and 2 homers, bringing in 117 RBIs. He also managed to get walked 125 times while getting plunked by the ball an unlucky 13 times. He was so unlucky at this that he actually led the AL in 1935 in hit-by-pitches for a season (5 times). Ouch. He did manage to earn a .258 average while wearing Number 8, though. Jack Brohamer - 5 seasons (1972-75, 1980) - We first saw Brohamer wearing Number 7, and we will see him again wearing Number 10, since he only wore the Number 8 during the 1980 season. He played in 53 games (142 at-bats), getting 32 hits with 13 runs (15 RBIs) with 5 doubles, 1 triple and 1 home run. He left the Tribe and the majors that year, batting .225 for the season. The card pictured is something of a weird composition. It appears the Brohamer is about to be tagged out, right? Perhaps, but then what is the while blur in the lower left near the trophy? It looks like a ball to me... Is there some kind of "Bad News Bears" switcheroo going on here!? 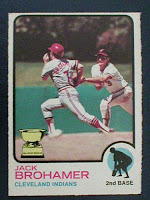 As far as the Brohamer card, it looks like the shortstop (Bobby Grich!) is moving into position to field the ball, which is on its way up the middle. I think you're right about that. Neat photo. Bob Hale just couldn't make his mind up! He wore 6, 10, and 20 with the Orioles (1955-1959). Albert Belle of course wore 88 in Baltimore, since a certain Iron Man had 8. And Hank Foiles...let's see...he wore 36 for the Birds in 1961. Albert Belle on a '73 Topps football card? How weird is that? I'M HAPPY YOU LIKED JACK, HE IS MY COUSIN. ALL THOUGH I DO NOT KNOW HIM WELL. I DID GET TO SEE HIM PLAY I LIKED HIM TOO !!! BONNIE B.
I dig that Belle card. Those SCD cards are not easy to find now a days.